This Large Chimp puppets really is fantastic. Their large size means that both children and adults can use them with ease. They even come with their own banana! Our large primates have full mouth movement, loads of character and their very own banana! They have been re-designed this year so the mouth movement is better and so is the material! Average height – 80cm. 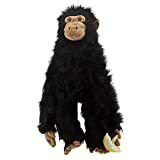 This entry was posted in Discount Childrens Toys and tagged Chimp, Company, Hand, Large, Primates, Puppet by Childrens Toys and Games. Bookmark the permalink.